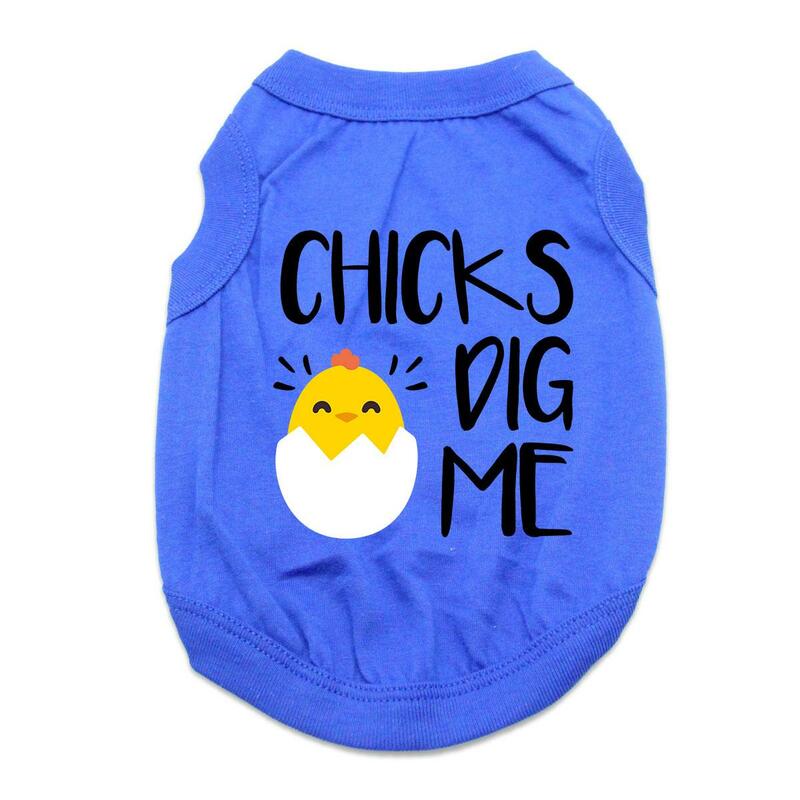 Show your pet's fun side with this adorable Chicks Dig Me Dog Tank in Blue! 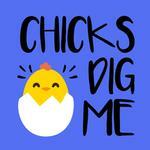 The Chicks Dig Me Dog Shirt will bring out smiles during your outings this Easter season! Actually, this sweet style works year round for dogs that are cute and confident! This is a custom design that we've created especially for BaxterBoo customers in our very own T-shirt print shop. This has been carefully printed on a 100% cotton tank. Chicks Dig Me Dog Tank - Blue Customer Photos - Send us your photo! What do you mean there’s no treats in these eggs? Goofy loves to play, cuddle, and sun bath on the porch. He’s our little goof ball! Winston loves his tees and feels he looks quite dapper in this one! SnickleFritz looking enthused about his new Easter shirt. Houdi in his Easter shirt....Chicks Dig me! Mickey was so handsome in his "Chicks Dig Me" baby blue shirt. It fit perfectly and he was a big hit at all the Easter events we attended. The "chicks" kept giving him belly rubs all the time and he loved it. Posted On 04/04/18 by Tanya K from Milwaukee, WI Yes, Tanya K recommends this product! I got this shirt for my Boston Terrier puppy for Easter & I couldn't be more happy. Its good quality material & just looks so cute on him. Everyone loved it. Posted On 03/17/18 by Jennifer S from Morristown, TN Yes, Jennifer S recommends this product! Quality of this product is not great. Words and image seemed a little faded and it doesn't seem very durable at all. I'm nervous to wash it because I don't want the words/image to crack. Overall it's cute and was a good price but won't last very long. Posted On 06/11/17 by Monica C from South Bend, IN Yes, Monica C recommends this product! Perfect fit for my little guy. Can't wait to see him strut his stuff around the neighborhood chicks. Posted On 04/17/17 by Melissa M from Orlando, FL Yes, Melissa M recommends this product! This shirt was a big hit with everyone that saw my Mickey boy. It was comfortable and he was so handsome and as it says, "Chicks Dig Me". I ordered a large for my 25 pound Boston and it's super snug! The sizing on this top is way off! Posted On 03/30/17 by Gina E P from bklyn, NY Yes, Gina E P recommends this product! I thought this was the cutest for my doggie. It looks like it will give in the body and fits great. Posted On 03/26/17 by Jacqueline O from , NJ Yes, Jacqueline O recommends this product! Beautiful quality shirt but runs small. I ordered large but sent back for x large. I have a Cockapoo who weighs about 25 lbs. large was too small. But we love the shirt. Baxterboo is the first place I come to find what I'm wanting for my dogs and I always have success. My boys have their own little coat closet because of the great variety. I enjoy shopping this website.